An MP has accused Sports Direct of “casually mistreating” their staff after a sign banning workers from speaking any language other than English was posted on Twitter. 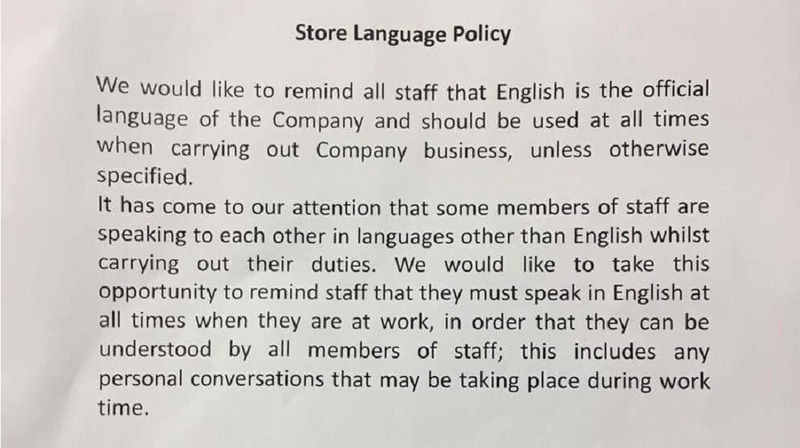 A photo of the sign, which according to the poster was taken at the store in Bangor, says that English is the official language of the company and that it should be used at all times. A spokesperson for Sports Direct told Golwg 360 that the sign was more relevant in their shops in England than in Wales. “It has come to our attention that some members of staff are speaking to each other in languages other than English while carrying out their duties,” the sign says. “This includes any personal conversations that may be taking place during work time. According to the 2011 census, 65.4% of people in the county of Gwynedd, where Bangor is located, are Welsh speakers. A picture of the sign was shared on Twitter by Ben Alun Screen who invited other users to express their displeasure to the company. The Welsh Language Measure 2011 states that if a person feels that someone has interfered with their right to use the Welsh language, they can ask the Welsh Language Commissioner to investigate it. “This can include situations where someone says that a person shouldn’t use Welsh (verbally or in writing) with another person who also wants to use it,” it says.